Pictured (L-R): Front: David Renzer, Chairman, Spirit Music Group and Alan Ett, CEO, Spirit Production Music. Back: Schuyler Moore of Stroock & Stroock & Lavan LLP Jon Singer, COO/CFO, Spirit Music Group; and Ross Cameron, Vice President of Acquisitions and Business Development. 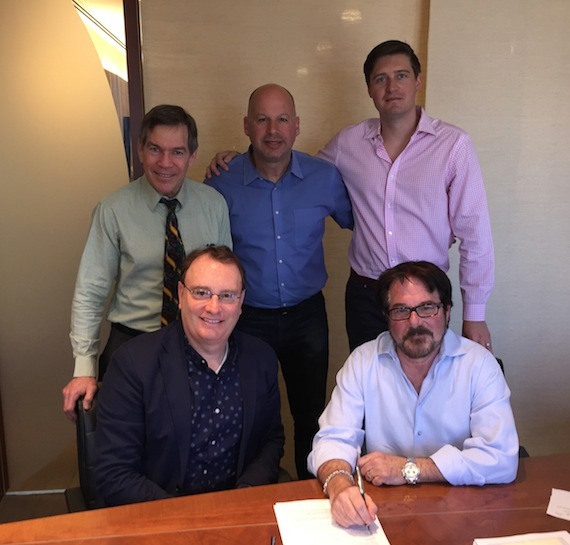 Spirit Music Group has formed a new division, Spirit Production Music, and has acquired the production music divisions of Alan Ett Creative Group (AECG), including the prestigious Opus 1 Music Library, The Music Collective and Audio Horizons companies. Announced today (March 14) by David Renzer, Chairman, Spirit Music Group and Jon Singer, COO/CFO, Spirit has tapped Alan Ett to lead the new division, which will be based in Los Angeles. Through the deal, Spirit will acquire over 150,000 high quality production music tracks and will represent over 40 unique music libraries. Employees from both AECG and Spirit Music Group will be part of the new organization going forward. The creation of Spirit Production Music marks the latest in a series of significant acquisitions by this independent music publishing operation. In July 2014, Spirit Music Group acquired Cal IV Entertainment, marking the company’s first presence on Nashville’s Music Row and bringing top writers and 25 No. 1 copyrights and top 10 singles into the fold. In January 2016, Spirit continued to expand its footprint through a deal with Frank Rogers, bringing another 40 No. 1 hits along with a roster of top artists and writers. In recent years Spirit also opened a London office and established Spirit Music Latino.